The British Gazette » Brexit: Betting the farm. 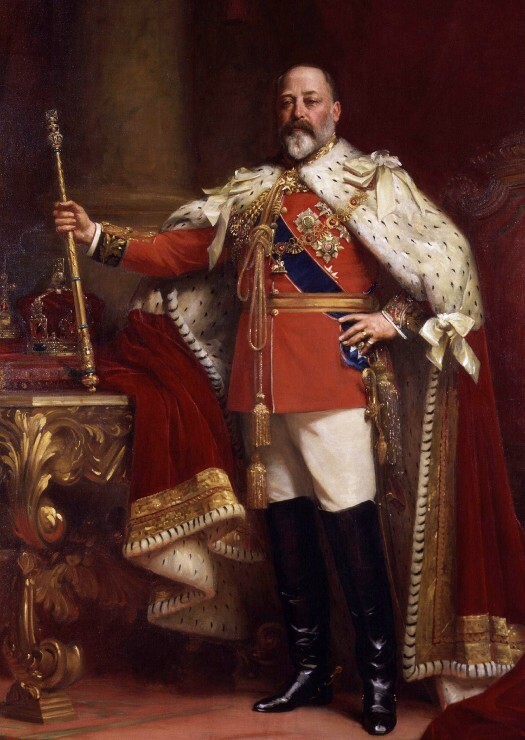 Above the coronation portrait of his late Majesty, King Edward VII. Our late King was a bon viveur but he did make some sound observations in his life. A very sound and sensible one was that a man [includes women] should never gamble that which he cannot comfortable afford to loose. In other words, for a person on an average income, spending £10 month on the Post Code Lottery is affordable. However spending £100 a week on Lotto tickets and scratch cards is not. When the Chameleon went a begging to the EU for some terms to put to the British People this organ was expecting the EU to hand him a fig leaf to cover up his embarrassment. However, they did not even do that. Instead, clearly from what Doktor Alice Weidel (below) says, the French side of the Franco-German axis decided to gamble and to send the Chameleon back with nothing. For what it is worth – now nothing, as the past is the past – had instead of the Chameleon’s wish list – which tilted towards challenging the EU project, if Germany had pushed the French and Spanish arms firmly up between their respective shoulder blades and have suggested that the Common Fisheries Policy would be terminated in say, five years, and that from then on the UK and the Irish Republic would have the sovereignty of their waters restored to them, on the condition that a proper agreement is worked out to allow grandfather rights of EU boats to be established, then the Chameleon would have returned triumphant, Tory divisions over the EU would largely be put to bed and with the interests of British fisherman satisfactorily dealt with the British People would have voted to remain within the EU with a thumping majority and all would proceed smoothly forward! But the EU did not do this! They decided to “bet the farm” (the phrase which our American friends have coined to describe betting everything you own) and to gamble on the British People not voting to leave the EU. When this gamble did not pay off, a sensible collection of EU politicians would have realised the danger and would have adopted the policy Dr. Weidel advocated in the chamber. But no! They still gambled. With that which they could not afford to loose. The EU are now gambling on the Europhiles in the House of Fools (of which there are many) getting their “People’s Vote” aka a second referendum or in extremis, on the eve of a No Deal Brexit, revocation of Article 50. Today, as Doctor North in his blog-post describes (http://eureferendum.com/blogview.aspx?blogno=87193) today is a good day for the fools in the House of Fools to indulge in their foolishness! #1: Vote in favour of Madame’s Meaningless Vote #4 to enable Madame to go forth to Brussels and beg the EU for an extension of time to allow for the enactment and implementation of the Withdrawal Treaty. #2: Pass a motion directing Madame to use the Royal Prerogative to revoke Article 50. #3: Do nothing and wait for a No Deal Brexit to happen. NB: None of these options are good options! In fact, if there were a political scenario specially set up to be apply the phrase, “This is a classic “No Win” situation” – this situation is it! Insofar as Meaningless Vote #4 is concerned, Reuters (https://www.reuters.com/article/us-britain-eu-vote/unlikely-there-will-be-a-vote-on-pm-mays-brexit-deal-on-tuesday-uk-government-source-idUSKCN1RD2O0?il=0) are reporting that it is unlikely to occur tomorrow but could be this week – if Madame and The Speaker (for it is He) can come to an agreement on it’s form. The one sure-fire way of A, getting Him to agree is to attach the Kyle-Wilson amendment to it – the so called “Confirmatory Vote”. This more than likely would also cause a majority of the fools to vote for it. This of course would call for a long extension to allow time to organise the “Confirmatory Vote”, aka, a “People’s Vote”, aka a “Second Referendum”. Now of course the Remainers (Europhile Labour and Tory MPs) and Remainiacs (Lib-Dem and SNP MPs) are both of the opinion that the result of a Confirmatory Vote/People’s Vote/Second Referendum would be a Remain victory. There are good reasons for them to be confident. This is because it appears that amongst the voters, the ERG/UKIP’s message that Madame’s Withdrawal Agreement is not Brexit but something labouring under the acronym, “BRINO” (Brexit In Name Only). Legally this is NOT the case. But surveys show that many who support Brexit think this. This means that were they presented with a binary choice of enact the Withdrawal Agreement or revoke Article 50, they would see no point in voting! Conversely however, Remainers and Remainiacs alike would enthusiastically vote for revocation! What this means is that IF the UK ends up remaining in the EU whether through a Confirmatory Vote/People’s Vote/Second Referendum or in extremis, Madame revoking Article 50 using the Royal Prerogative following a motion directing her to, many voters will feel (with much justification) that they have been betrayed. IF of course Madame remains obdurate then it might be the case that the Meaningless Vote will be put before the fools at the last minute at a special sitting on Saturday 6th or even early on Monday 8th – the idea being to pressure the fools with the clock. This because the EU have asked for proposals from the UK government to be submitted by Monday 8th in order for them to be circulated amongst the 27 members states for their consideration. What is looking increasingly clear is that whatever choice the fools opt for one of the outcomes will be a General Election. If #1 occurs then the Tories will be able to organise Madame’s retirement and replacement in good order – relatively speaking! If however #2 or #3 occur, Madame’s retirement and replacement is unlikely to be in good order! The Tories would wish to replace Madame quickly and without a prolonged leadership election – as there would be a General Election to fight! The most likely outcome would be a quick round of elimination voting, whittling down a number of candidates to come out with one winner in a marathon session of the 1922 Committee meeting.